Buffalo Sabres fans, rightfully so, were apathetic after the season opener (4-0 loss to the Bruins). The play looked like all of the previous season. It also did not help that the Bills had given the “Mafia” much to cheer for. There was a need of relief that went unsatisfied. Now that their season is 3 games in, the Sabres find themselves above .500 for the first time in October since 2013. The Halloween month has not been kind to this franchise and there are signs that they could be going in the right direction. Through this homestand, Carter Hutton has been the key to their success. The 32 year old’s saves have been timely and he has been a steady influence for young players. The past two games (Rangers/Golden Knights) have shown improved passing and ability to keep opposing players out of high danger areas more often. It also helps when the captain has 4 points (3 goals) over those 2 games. The Golden Knights were not a walk in the park and they will be further tested tonight by the Colorado Avalanche. Both share a 2-1 record and have players with significant offensive ability. Getting to the point, tonight’s game has potential for some fun hockey. After signing Carter Hutton, it was still unclear how he would handle being the top spot in Buffalo. For most, he has succeeded expectations from being an unknown. With a .943 SV%, Hutton is certainly performing as a starting NHL goaltender. And like all starters, he will not play every game. Linus Ullmark, clearly protected by the Sabres during expansion, should be seeing work soon. Will his season premier be tonight or will Phil Housley go with the hot goaltender? The Sabres offense over the past two games has been timely but not exactly consistent. Almost half of their goals have come with the man advantage and they were badly out shot. Thankfully, the barrage of shots faced were mostly in pressing situations and few were highly dangerous. But Colorado has more dynamic forwards than the last two teams. Their pace and skill will not be desired in their defensive zone. The best way to counter the Avalanche is by matching, or besting, their shot pressure. Buffalo’s five man units must create danger for their opponent or risk being blown out. Despite being a positive possession player, the new left winger has not produced. Jeff Skinner has just 6 shots and has been widely known as being a goal scorer. This is probably not something to worry about but it would be nice for him to pot a goal or more tonight. 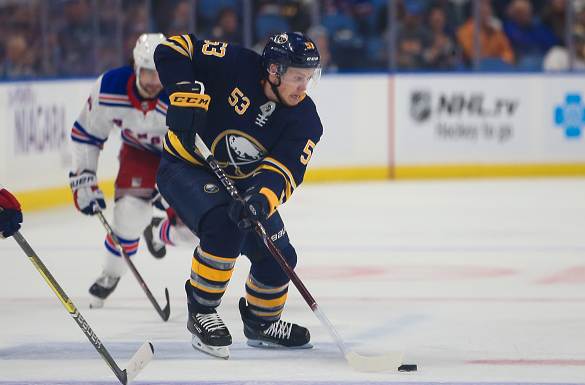 Skinner has been playing with Patrik Berglund, who is not exactly Jack Eichel in terms of playmaking. Would the former Hurricane be better with Casey Mittelstadt? The two may complement each other, especially as Tage Thompson has not exactly been impressive. The lines should be announced at some point during the day but a line change may allow Skinner to be Skinner. 6-4 Colorado; a high event game but Buffalo’s penalty kill cannot handle the Avalanche’s top powerplay unit. Next Post: Is It Time for “Jumbo Joe” Thornton to Take a Knee?